Welcome to the River Room! Over the years, this historic building has had many uses, but when it became a restaurant its original walls and hard wood flooring were uncovered and restored. Take out the tables and put massive hardwood counters on either side of the room. That’s what you would have seen in 1888, when the J.B. Steele Building first opened for business. Two stores on site were known as the Steele-Moses stores, with one side selling dry goods and the other, food. Upstairs, hundreds of hats were made for the citizens of Georgetown. Two years later Georgetown experienced growth and modernization with electric lights, telephone and telegraph service and the installation of sidewalks. It was also around this time the town was beautified with the planting of live oaks. Today their massive glory, draped in Spanish moss, help showcase the area’s heritage that goes back to the eras of Spanish explorers and Francis Marion’s patriotic fight during the American Revolution. The Steele-Moses stores remained in operation for 50 years, then were used for a series of department stores and shoe stores each of which lasted no less than 25 years. Upstairs became a tailors shop and, finally, an apartment and office space. This historic location was chosen as the new site for the River Room Restaurant, which had outgrown its original space just one block down the street. During renovation, the original brick walls and heart pine flooring were restored, and the scenic dining room was built overlooking the harbor. 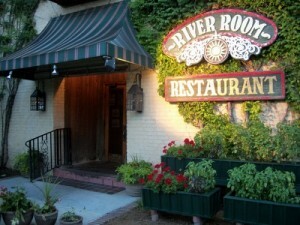 The River Room moved to this new location in 1988, 100 years after the J.B. Steele first opened for business.